Jenna Walsh, BSF '13, will begin Bank of America's Financial Management Associate Program, a full-time position, after graduating in May. Like many graduating seniors, Jenna Walsh has a mental countdown running in her head—but hers doesn't end at graduation. Instead it extends to June, when she'll begin Bank of America's Financial Management Associate Program (BoA). Walsh, BSBA '13, will begin the two-year program in Charlotte, North Carolina just six weeks after she receives her diploma. She had previously held a summer internship with BoA in New York. When Walsh started at Kogod in 2009, she only specialized in International Business; she didn't add a Finance specialty until a study abroad experience opened her eyes. "I was studying in Madrid right as the financial crisis hit," Walsh said. "I was instantly drawn to the currency crisis happening around me." She added the second specialty as soon as she returned to Kogod, where her finance classes really drew her into the field. "I definitely enjoyed my finance classes more than all my others," she said. Walsh began her search for a summer 2012 internship early and left no stone unturned. "I think I applied to every big bank under the sun," Walsh said of her search. "I really tried to network and build connections, and I think it paid off." 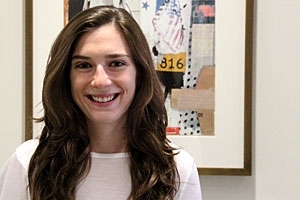 Walsh spent the summer working in the global wealth and investment management department at the BoA offices in New York City, commuting each day from her parents’ home on Long Island. "It certainly wasn't an easy summer job. There were mornings I didn't want to get up and nights I wished I could have been at the beach with my friends," she said of the experience. "But I really had the chance to prove myself and it really paid off." After her internship ended, Walsh applied to BoA's associate program and earned a second-round interview: a weekend of meetings in North Carolina. "It was 20 hours of stress followed by about 10 days of waiting. It was miserable," she said. But in the end, Walsh went home for Thanksgiving with the knowledge she had a job waiting for her after graduation. The program, which hires approximately 70 young graduates each term, is divided into two one-year rotations in different divisions of BoA. Walsh will be notified of her division placement in April. "I just feel very fortunate," Walsh said. When asked what she would tell other students hoping to have a job waiting upon graduation, Walsh emphasized making the most of electives, crediting them for making her a more well-rounded student. "The little things add up, so the more diversity you can study the better. I think I got a lot more out of taking classes like personal finance and soccer marketing when I was abroad that I would have just taking yoga." Walsh also said she can't stress enough how important networking is to finding the right internship. "I know it's said a lot, but networking really is the best, that really is how I got my internship and thus my job," she said. "You just never know who you're going to cross paths with, especially in a place like Washington, D.C."